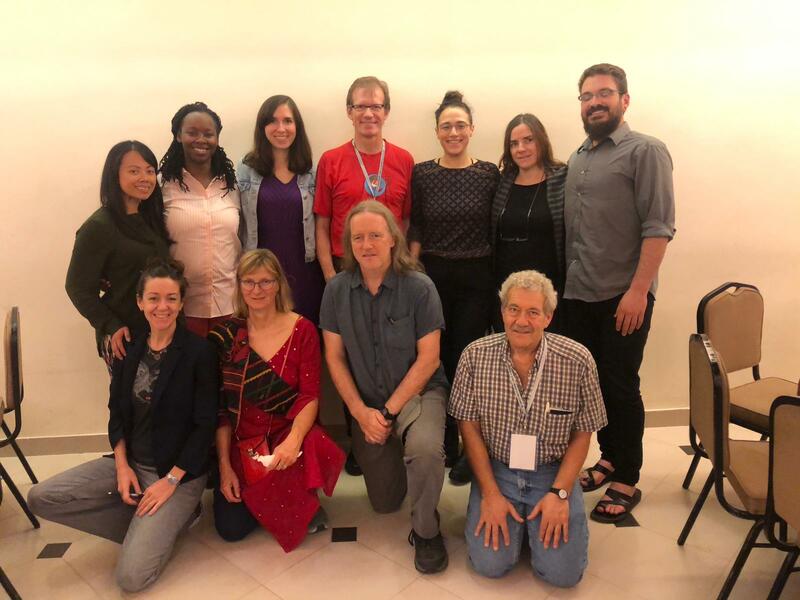 From November 16-19, health activists from across the globe gather in Savar, Bangladesh for the 4th People’s Health Assembly (PHA4). The Assembly is a unique space where civil society organizations and networks, social movements, academia and others strengthen solidarity, share experiences, learn from each other, and strategize together for future actions. Following, we share reports and reflections from PHM-NA attendees! On November 16th, I attended the session “Occupation, military interventions, and refugees.” In addition to being an excellent session, the question and answer period was rich with contributions from people from several additional struggles of occupation/displacement. I was particularly impressed by Rabbub Mohamed Lamin Mehdi, who shared from her experiences as a Saharawi physician and was generous enough to spend additional time discussing the Saharawi struggle with us after the session ended. Rabbub described how the Western Sahara has been long-disputed given its rich natural resources. It was colonized by Spain for many years however, despite promises of independence, after decolonization it was annexed by Morocco in 1975. Annexation led to occupation and violence, and Rabbub, as a young baby in the arms of her parents, was one of the many refugees that were forced to flee. In the 1990s, the UN began brokering a peace deal that mandated a referendum for the Saharawi people to have the option to vote for independence, but the referendum keeps being rejected by the more powerful governments involved and has yet to happen. In the meantime, many Saharawis continue to live in limbo under occupation, with minimal access to higher education and basic social services. This session was given by Mauricio Torres (PHM-LA, Colombia). He talked about understanding the difference between a hegemonic approach versus an alternative approach to understanding health systems. The hegemonic approach favors the marketization of health services and views patients as consumers. This view is problematic because it removes the autonomy of the community to control their own health and puts it in the hands of the health care providers. Natural processes are converted into pathologies, such as the menstrual cycle and child birth, requiring management by a health care provider. It is important that we insist on putting the power back in the hands of people and steer the conversation and development of health systems using an alternative perspective. Some aspects of both are listed below. It is also important to consider the 3S’s and 5D’s when thinking about the alternative perspective. One of the panels focusing on community health work in Bangladesh displayed the strange positionality that North America plays in relating to Health for All. A question was posed to the panel concerning problems with perceptions of women riding bicycles (a key component of their program for literal service delivery purposes). A participant involved with the program responded to the question by addressing the rise in conservative Islam in the country. She continued that the program will not hire women who smoke or wear facial coverings, which I assume was niqab. The moment did not lead anywhere in the grand scheme of the conference – many had tense feelings, but kept silent – though it has stuck with me through my experiences. We in the global north have a long and dark history of institutional policing of the global south on what to wear, how to speak, and whose epistemologies are valid. The vast majority of the conference was overwhelmingly supportive of all liberation, but this, along with a few moments scattered throughout, shows that the work to be done “out there” also needs to be done “in here,” though with a delicate understanding of where we stand in relation to each other. It was not my place, or any of our North American movement, to take the opportunity for intervention. Yet it is important for us, in the Global Assembly, to sit with the fact that we still have work to do in our own communities and programs to seek equity for all. The roadmap isn’t clear how to do this ethically and justly, but our solidarity must mean doing what we can at home. This talk focused on the impact of corporate control of the seed market. It highlighted that very few companies control most of the seeds in the world. As a result of controlling the seed market, they also control food variety and options for farmers and consumers. This has resulted in a reduction of the diversity of foods available, and likely a decrease in the micronutrients in these foods. Also, in many countries, women are the primary people involved in seed saving, and the ban of seed saving has eliminated many women from the agricultural work force. Monsanto responsible for many of these changes. The control of seeds constitutes a human rights violation. However, even though many human rights organizations aim to eliminate hunger, the SDGs to not explicitly address the right to quality food. There was also a focus on distinguishing food security from food sovereignty. The concept of food security is a top down approach that does not address the causes of deficiencies in micronutrients: it simply aims to replete micronutrients through fortification and other processes. Also, 75% of the WHO budget is from the private sector, and thus does not eliminate the influence of profit driven corporation’s participation in finding solutions. Food sovereignty is a grassroots approach that includes indigenous people being empowered to supply their own food. It increases food diversity, seed control and naturally includes micronutrients since food is locally grown. Finally, this talk addressed the health consequences of lack of food sovereignty including the double burden of calorie dense, low-cost foods. It showed that many middle income countries now have increases in obesity with simultaneous increases in child stunting and malnutrition. In the United States, the mainstream narrative around reproductive health centers the idea of “choice”, usually in terms of choosing to continue a pregnancy. What we know is that globally, and even nationally in BIPOC (Black, indigenous, and people of color) and immigrant communities, the realities around bodily sovereignty and access to basic reproductive health care are much more complex. Stigma, lack of education, and legality are three major barriers to safe abortion access and contribute to unnecessary maternal mortality and complications for what is otherwise a straightforward and uncomplicated procedure. 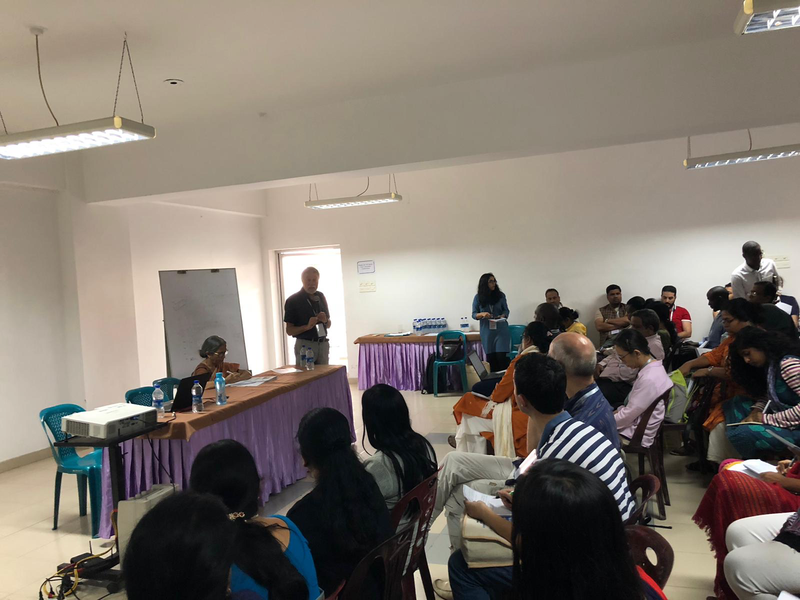 The panel discussion centered developing and established research around perceptions and access to care in four major Asian subcontinent countries, the findings of which aim to aide in the implementation of policy and advocacy changes in favor of women’s health. And in true PHM fashion, the post-panel dialogue was replete with rallying cries, global narratives of struggles and triumphs, and calls for transnational solidarity. Over 1300 people from some 73 countries gathered in Savar and Dhaka, Bangladesh, for over four days of meetings, workshops, conversations and celebration. How did people talk to each other? Through an amazing team of volunteer interpreters! The organizers originally planned for the event to be held in English, French, Spanish and Bangla (Bengali). In parallel two teams were formed. There was no money to pay interpreters, but funding was secured to bring in volunteer, solidarity interpreters who understand what the People’s Health Movement is all about. 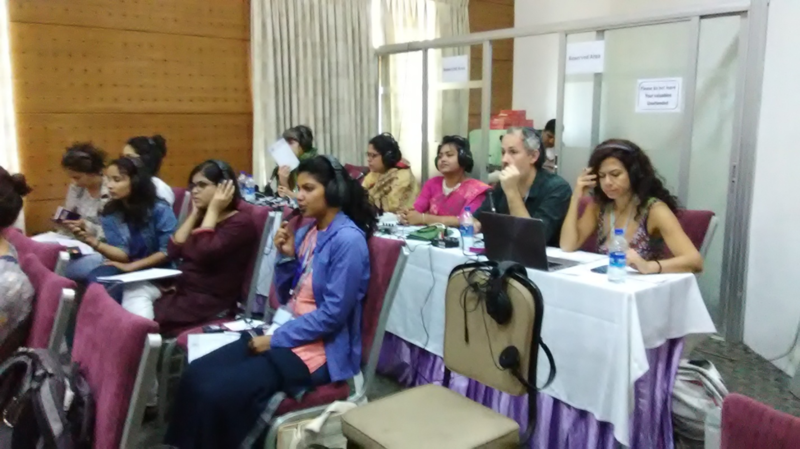 A French conference interpreter put together a team of 21 experienced conference interpreters from Europe and the United States who would cover English, Spanish and French. Here in Bangladesh, the really exciting work was happening. 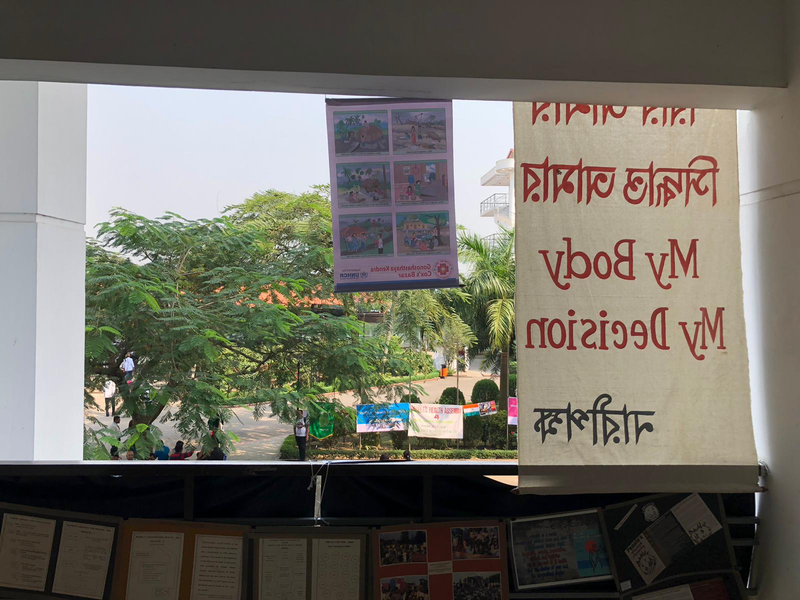 A bilingual Bangladeshi researcher put together a team of 12 Bangladeshis who study or teach English, but who had never interpreted before, much less simultaneously. 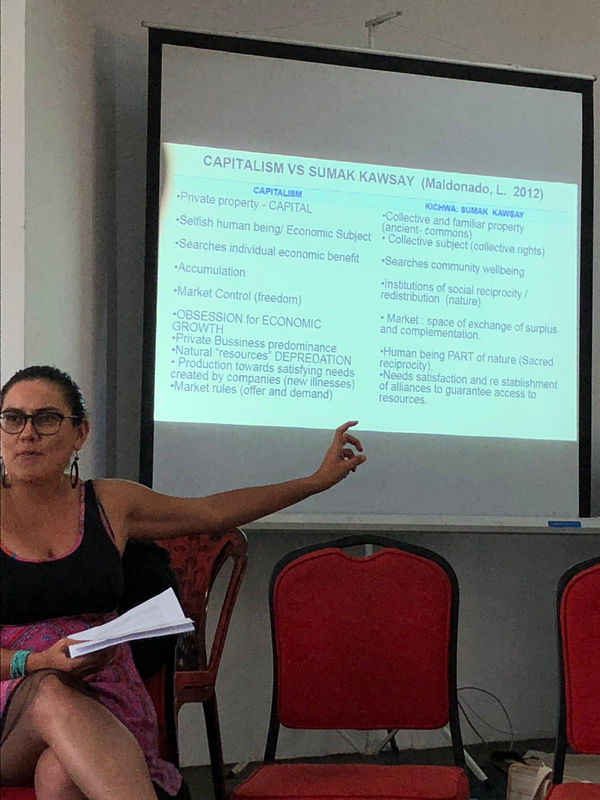 Over three months they were taught the basics of interpretation, practiced techniques and studied the vocabulary that comes up at a conference of global health activists. They were so proud of themselves and all the interpreters were impressed with their emerging skills. Hopefully, this new skill will continue to serve them. While the official title of the Assembly is “Health for All Now,” an unspoken theme is the topic of neoliberal effects on militarization, occupation, and health. From the Rohingya refugees currently fighting for their status in Bangladesh to the liberation of Palestine, the vast majority of sessions thus far have touched on this topic. The panel entitled “Occupation, Military Intervention, and Refugees,” began with an acknowledgement of how relevant the topic is: one of the intended panelists was not stopped entering Bangladesh (like many of the international attendees) but was refused permission to leave Gaza to attend. To begin to discuss health one must be able to reach the table, which conflicts and militarized disasters often limit. One of the most moving points of the conference thus far has been the question and answer section of this panel. While it was meant to be questions to the panelists, the outcome was audience members relating their own experiences of living under occupation from Morocco by Sawharis, those living in Central African Republic, and the current experiences of Muslims living in India. Being in space where mutual experiences that could be shared in that way was powerful, especially in hearing how people can connect their experiences to each other in a narrative that expands beyond nations. 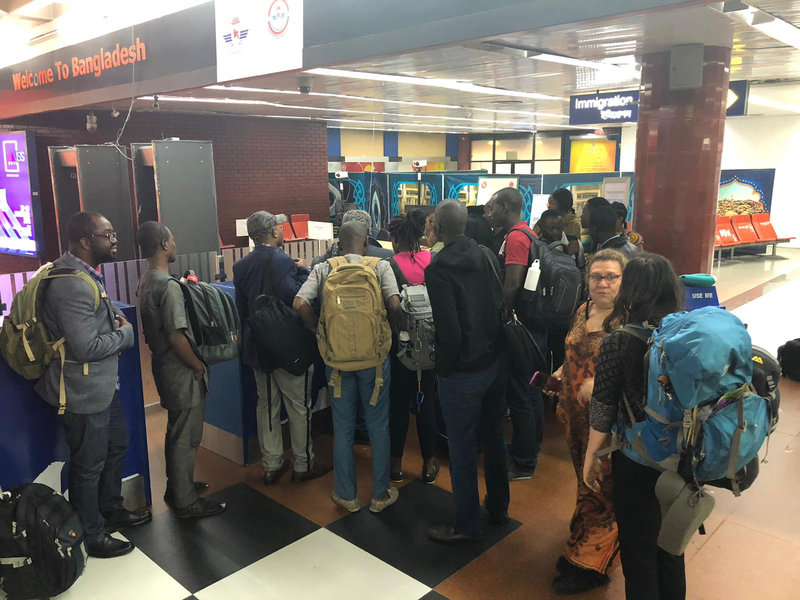 On the November 17 organizers expanded the workshop called “The Politics of Primary Health Care and Universal Health Care Coverage in Africa” to include a Latin American perspective to include the insights of Dr. Samuel Garcia from El Salvador. The session began with a tour-de-force of Primary Health Care (PHC) from the Alma Ata Declaration to the Alternative Civil Society Astana Declaration on Primary Health Care by Professor David Sanders, a long-time activist for freedom in Zimbabwe and in South Africa and currently the Co-Chair of the global steering council of the People’s Health Movement. Presenters on the panel included a lawyer, a journalist, a public health professional and a Person Living with HIV/AIDS, all leaders in their communities and with PHM. They explained the current state of PHC in several countries in East Africa, including Tanzania, Uganda, Kenya, Zimbabwe). Following their presentation, Dr. Samuel Garcia, who trained at the Latin American Medical School (ELAM) in Havana, Cuba, gave a presentation on PHC in El Salvador and particularly the community of Estancia, Morazan. Dr. Garcia contrasted this with the presentations of his colleagues from Africa and built on David Sanders foundation with focused examples. The entire session was informative and inspiring, yet outlined many upcoming challenges. The recent official WHO mandate for Universal Health Care contains insidious continuations of top-down, non-comprehensive, privatized (“public-private partnership” Trojan horse) approaches which must be met with a comprehensive primary health care perspective if we are to really achieve Health for All, Now! Or, for that matter, ever. A delegation from PHM-NA is attending the Assembly!